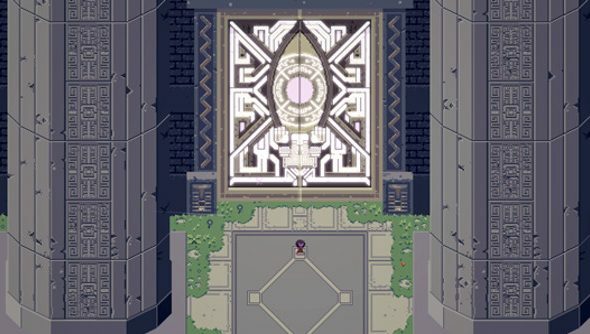 Titan Souls has impressed us every time we’ve had a chance to take a look at it. Jules really liked it in its earliest days as a Ludum Dare project, and he was even more taken with what he saw at Gamescom. To know Titan Souls is to love it (or to be driven mad by it, but we’ll get to that in a second). So now Devolver have released a gameplay trailer to show you what it’s all about. If you’ll be at PAX Prime, you can apparently try it out at the Indie Megabooth. Of all the games I saw from Devolver during E3, Titan Souls was probably the most put-together. It had that crisp responsiveness, clear visual feedback, and fast-pacing that all adds up to that wonderful feeling of tightness in an action game. The funny thing is Titan Souls seems just like the kind of game I’d hate. I mean, it’s literally a game of boss battles, and nothing else. Boss battles are terrible, aren’t they? Well, no. Titan Souls is a reminder that a good boss battle is about studying and learning on the fly, and then trying again and again to master the pattern and timing needed to succeed. Titan Souls doesn’t just try to wear you down by making you pour shots into a giant bad guy. A good boss battles stretches both the mind and the reflexes. That’s probably why, when I started getting slaughtered again and again by the first boss in Titan Souls, I curled into an angry ball around the controller and snarled at anyone who suggested I give up and let someone else give it a try. No, Titan Souls always seems to keep you right at that place where you know you can do this. Just one more try. Titan Souls is due out in early 2015.